Why is it that psychopaths frequently get away with cheating, abuse, backstabbing, fraud, theft, and other nefarious activities — even murder? Here are 10 strategies that these exploiters may employ to escape accountability. 1 Psychopaths lie fluently and convincingly. They lie while looking you right in they eye, without a trace of nervousness or guilt. If they’re caught in a lie, they easily lie to cover the lie. It’s no wonder they are believed. 2 Psychopaths protest with righteous indignation. THEM of such behavior? Everyone doubts you, and you even doubt yourself. 3 Psychopaths smear their accuser/target. If that’s you, they ruin your credibility, often starting the smear campaign long before you even realize what they’ve done to you. When everything blows up, you have no support. 4 Psychopaths become whatever will serve their agenda. Should they express remorse? Pull rank? Plead ignorance? Portray the bumbling fool? They’ll do whatever enables them to escape consequences. 5 Psychopaths plan many moves in advance. They plot and scheme, lining up allies, fall guys, minions, bank accounts, transfers, even replacement romantic partners. Then they make their move. 6 Psychopaths grab targets of opportunity. They are always on the lookout for someone who is useful to their agenda. If you have something they want, they figure out where you are vulnerable and use it against you. 7 Psychopaths know how to go right up to the line without crossing it. Psychopaths often engage in behavior that is immoral and unethical, but not illegal. Or, the situations are he said/she said, with no proof of anything. There is nothing to prosecute. 8 Psychopaths size up and flatter whomever they need to convince. Is it a boss, a police officer, a therapist, a judge? They align themselves with that person, pretend to be on the same team, and turn an adversary into an ally. 9 Psychopaths have the dirt on whomever is passing judgment. They put adversaries, work superiors and legal authorities in compromising positions, and then engage in blackmail. Suddenly, the case is dropped. 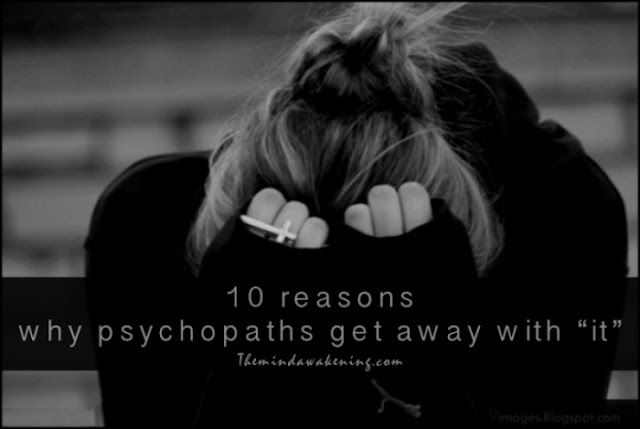 10 Psychopaths expect to get away with their actions. They believe they can talk themselves out of anything, or divert attention to someone else. In many cases, they’ve been doing it successfully all their lives. Okay, sometimes psychopaths have to face the consequences of their actions. After all, experts say 25 percent of the prison population are psychopaths. But even those who are locked up probably got away with a lot of bad behavior before they were finally put behind bars.